German authorities have released another 101 images of artwork found in a Munich apartment which had been stolen by the Nazis. This release, now totaling 219, include drawings and watercolors by Edgar Degas, Paul Cézanne and Pablo Picasso as well as the painting Two Riders on the Beach by Max Liebermann. The works were found in the Spring of 2012 during an investigation into money laundering. The apartment owner, Cornelius Gurlitt’s was stopped on a train to Swizerland in 2010 carrying 9,000 euros in cash during a sweep looking for Germans with undeclared bank accounts. The works were discovered during a follow-up search of Gurlitt’s home which uncovered over 1400 pieces of art, hoarded in disarray, some lying behind tins and packets of food. Gurlitt was the son of a prominent German Art dealer, only one of four people allowed to seal “degenerate art” during the Nazi era. Gurlitt Sr., who died in a car accident in 1956, left all his paintings to his surviving family. 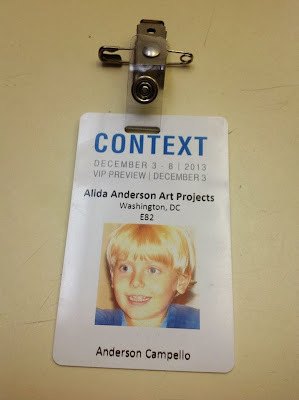 Context Art Miami hanging is done! And for the first time in the many years that I have been doing art fairs, we are actually finished with all the hanging and the fair doesn't even open until 5:30PM tomorrow for the VIPs!